As you may well be aware, just before Christmas last year in Brazil a mother gave birth to a healthy baby boys, who - fairly unusually it has to be said - has two heads. Of course, these twins are by no means the only conjoined twins in the world, but as they were Brazilian boys and completely medically inseparable as they share a heart, I got to thinking about football. football for Brazil. They shared a body and one ear. Brazilians are known worldwide for their footballing ability and there doesn't seem to be any reason that I can see that these twins should be any different. 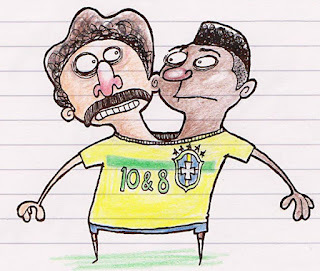 Many conjoined twins are connected in such awkward or ungainly ways as to completely preclude their participation in any form of professionally sanctioned sporting activity, but Jesus and Emmanuel are lucky enough to be pretty straightforwardly joined. As they share one set of organs, the body is a fairly anatomically standard, it just has two heads. There doesn't seem to be any bio-mechanical reason why Jesus or Emmanuel (actually, they'd probably both have to do it, or neither, when I think about it) couldn't become a professional footballer. However, at the professional level things are a bit more complicated. Why people have to make things complicated, I will never really understand, but they do. You can't just chase a bladder around and score some goals. There is PAPERWORK. Every professional player is registered and contracted to their club, so that they cannot play for anyone else. You can probably see where I'm going with this. What constitutes a football player? Is it number of heads? If so, Jesus and Emmanuel are two players. But if it is number of hearts, livers, lungs, kidneys, arms or legs, then they are one. Does it come down to number of surnames? If so the Neville brothers could have counted as one player as long as they could get shorts big enough. Maybe it's kit. One kit means one player. But Jesus and Emmanuel have two brains, two backbones. If they were to be classified as just one player, this gives them an advantage of one brain over all of their fellow players and in the majority of cases this is a bare minimum figure. Also they'd have an advantage in going up for headers. If Emmanuel missed it, Jesus could sneak in. The other issue is, if they were - as many Brazilian talents are - snapped up by a top European club, they would be subject to EU Employment Law. If Sampdoria decided that Jesus was the very player for them but Emmanuel's registration was being retained by Montpelier, could the EU Employment Tribunal sue Emmanuel's heart or winky for restraint of trade? Personally I believe that they should be allowed to play as one player, because they have one body. And this goes for any other sporting or physical activity. Come the day a baby is born with two heads and four arms I might have to question whether or not they should be playing singles or doubles tennis. Likewise, if Jesus and Emmanuel were to become chess grandmasters, I would have to reconsider my position. Legal issues are not my strong point. Jesus should play alone. That way he would only count as 1 player, but he could not be blamed for having his brother tag along.